EXT – Luke 21: 25–28, 34–36 – The Son of Man is coming. The Revised Standard Version [RSV] text is used in these commentaries. “And there will be signs in sun and moon and stars, and upon the earth distress of nations in perplexity at the roaring of the sea and the waves,  men fainting with fear and with foreboding of what is coming on the world; for the powers of the heavens will be shaken. “But take heed to yourselves lest your hearts be weighed down with dissipation and drunkenness and cares of this life, and that day come upon you suddenly like a snare;  for it will come upon all who dwell upon the face of the whole earth. “Advent has a twofold character: (i) as a season to prepare for Christmas when Christ’s first coming to us is remembered; (ii) as a season when that remembrance directs the mind and heart to await Christ’s Second Coming at the end of time. Advent is thus a period for devout and joyful expectation.” (General Norms for the Liturgical Year and the Calendar, 39). “The weekdays from 17 December to 24 December inclusive serve to prepare more directly for the Lord’s birth.” (General Norms for the Liturgical Year and the Calendar, 39). The Church divides Advent into two parts: The first part begins today and goes on until December sixteenth celebrating the second coming of Jesus; then the second part begins, stressing the preparation for the celebration of his first coming at his birth. 2. The Gospel readings during this new ecclesiastical year are taken from St. Luke’s gospel. “And there will be signs in sun and moon and stars” — These words refer to heavenly signs. Luke, quoting Jesus, does not describe what these signs will be. From the remainder of this verse we can surmise that these signs will be fearful for people. “and upon the earth distress of nations in perplexity at the roaring of the sea and the waves” — These words refer to signs on earth. Some link these world upheavals with wars (Is. 5: 30) or with God’s anger against certain people (Wid. 5: 22). “men fainting with fear and with foreboding of what is coming on the world” — Luke is the only evangelist who describes the psychological reaction of people to the signs of a world in upheaval. 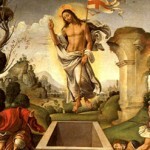 “And then they will see the Son of man” — “The Son of man” is a title that Jesus uses of himself. It is frequent in the Gospels and it refers to Jesus as sent by his Father to come into the world to preach, suffer, die and rise again. This passage adds that the “Son of man”, Jesus, will come in his divinity and power at the end of time. The title is used twice in this passage. coming in a cloud” — “Cloud” was a symbol of the presence of God. In the Old Testament the “cloud” revealed the presence of God by veiling the transcendence of his glory. Examples are when he spoke with Moses on Mt. Sinai (Ex. 24: 15-18), at the tent of meeting (Ex. 33: 9-10), during the forty years wandering in the wilderness (Ex. 40: 36-38), at the dedication of the Temple (I Kgs 8: 10-12), at the “overshadowing of Mary by the Holy Spirit (Lk. 1: 35), on the Mount of Transfiguration when the Father spoke from the “cloud” (Lk. :9: 34-35), when Jesus ascended into the cloud at the ascension (Lk. 21: 27). 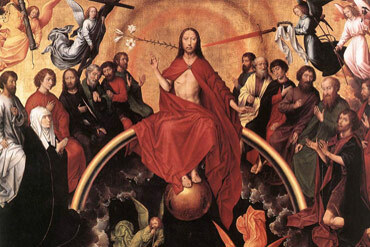 “with power and great glory” — “Power” was also associated with Jesus, as was “glory”. Jesus will come with divine power and in divine glory. Luke wrote frequently of the coming of the Son of man (Lk. 9: 26; 11: 29-32; 12: 8-9, 40; 17: 22-37; 18: 8). “Now when these things begin to take place, look up and raise your heads” — The meaning is: do not lower your heads in sorrow or dejection; raise them high in hope and joy. What is happening is to your advantage and your redemption. Jesus is coming for you. Luke tells the story of the woman who “had a spirit of infirmity for eighteen years; she was bent over and could not fully straighten herself”. The leader in the synagogue objected to Jesus curing her on the Sabbath. Jesus retorted, “Ought not this woman, a daughter of Abraham whom Satan bound for eighteen years, be loosed [liberated] from this bond on the Sabbath Day?” (Lk. 13: 11, 16). She could now stand erect and hold her head on high. She had been redeemed and liberated. “because your redemption is drawing near.” — The word “redemption” means to ‘buy back’. God did not have to “buy back” sinful people from any power. The Old Testament preferred to speak of God “liberating” his People. This explains the two different translations given here. The words in verses 27 and 28 contrast with the words in verses 25 and 26. In these latter two verses people and nations are described as terrified and full of fright because they will not understand what will happen. Verses 27 and 28 are full of hope and confidence for Jesus’ followers. They will know who is coming and why — to liberate and redeem them. They will be filled with joy. “But take heed to yourselves lest your hearts be weighed down with dissipation and drunkenness and cares of this life” — In spite of the hope and joy at the thought of the Second Coming of Jesus, people have to be vigilant and not fall into the way of sin. The Second Coming will be unexpected so one cannot be unprepared at any time. A similar idea was expressed forcefully earlier: (Lk. 12: 42-48). “and cares of this life” — Because of their involvement in the “cares of life” the people in Noah’s time did nothing to save themselves. So likewise the residents of Sodom (Lk. 17: 26-30). These “cares” choke the word of God (Lk. 8: 14; 10: 41; 12: 22, 25, 26). “and that day come upon you suddenly like a snare” — A trap to catch animals snaps suddenly and unexpectedly (Lk. 12: 40). “for it will come upon all who dwell upon the face of the whole earth” — No one will be exempt from this event. “But watch at all times” — Jesus is speaking and he calls all people to be vigilant for the signs of the last times. He offers two pieces of advice. “praying that you may have strength to escape all these things that will take place” —A major theme in Luke is prayer. Here Jesus calls on people so that they may be strengthened to take necessary precautions before the disasters approach. The reference is to the prayer of petition, an additional frequent theme in Luke (Lk. 5: 12; 8: 28, 38; 9: 38, 40; 10: 40; 22: 32). “and to stand before the Son of man.” ” — The second need for prayer is that people will live lives worthy of God now so that they may appear before the Son of man in a worthy condition with clear consciences. The first and main application must always concern Jesus. The main purpose of each Gospel is to describe Jesus for us and what his intentions are. This passage tells us that he is the Son of man who will come at the end of time in his divinity, power and glory. The heavens and the earth will be strongly shaken as in an earthquake. The signs will be frightening. Jesus is not coming to frighten. He does nothing frightening. He comes as power to strengthen and as glory to give joy and excite. He reveals his divinity. He tells us that he comes with great Good News — he is coming to redeem and liberate us from all that binds and keeps us from living in his presence of glory. What he wishes to instill in us is firm hope, the gift of the theological virtue of hope. Hope is the virtue most associated with Advent. It is the ‘Season of Hope’. It is worth reading The Catechism of the Catholic Church on the theological virtue of hope. Article 1817 tells us that “Hope is the theological virtue by which we desire the kingdom of heaven and eternal life as our happiness, placing our trust in Christ’s promises and relying not on our own strength, but on the help of the grace of the Holy Spirit”. Article 1818 adds: “The virtue of hope responds to the aspiration to happiness which God has placed in the heart of every man; it takes up the hopes that inspire men’s activities and purifies them so as to order them to the Kingdom of heaven; it keeps man from discouragement; it sustains him during times of abandonment; it opens up his heart in expectation of eternal beatitude. Buoyed up by hope, he is preserved from selfishness and led to the happiness that flows from charity”. Article 2771 reads, “The Lord’s Prayer is the proper prayer of ‘the end-time,’ the time of salvation that began with the outpouring of the Holy Spirit and will be fulfilled with the Lord’s return. The petitions addressed to our Father, as distinct from the prayers of the old covenant, rely on the mystery of salvation already accomplished, once for all, in Christ crucified and risen”. Note: Here is a special personal comment. See how simple and complete is the above quotation from The Catechism of the Catholic Church. I recommend that you peruse this masterpiece as much as possible.